One of the three delapidated houses at Fourth and Calapooia CARA is being asked to help rebuid. 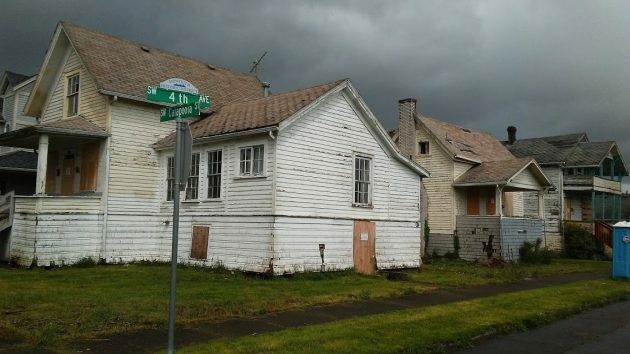 If the city of Albany wants three century-old houses in the Monteith Historic District rebuilt and preserved, it will have to put up a million dollars in urban-renewal aid. The issue comes up Wednesday when the advisory board of the Central Albany Revitalization Area meets. 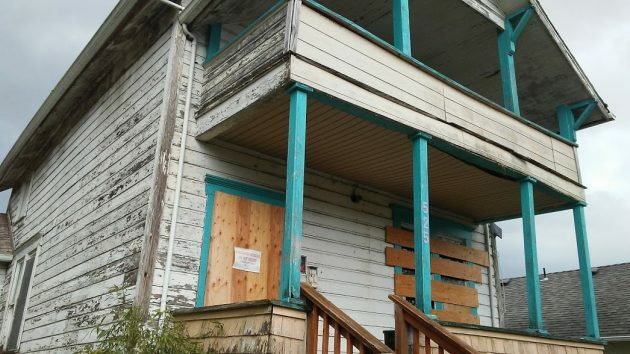 Mark and Tina Siegner, owners of the Albany construction firm Valley Homes Inc., bought the derelict houses at Calapooia Street and Fourth Avenue from the Signs of Victory Mission in February for $85,000. A few days later Mark told me they were evaluating whether to try to rebuild the structures, which had been condemned by the city as unsafe and uninhabitable, or replace them with something new on the single tax lot they share. That evaluation evidently has taken place. In an application to CARA, the Siegners say the houses would have to be taken down to the studs and completely rebuilt. Doing that, plus building a four-garage structure in back with two apartments above, would cost an estimated $1,419,400. Two banks have declined to make loans. The Siegners are asking CARA for $1 million, half as a 15-year loan, the other half as a grant if they complete the project. Restoration of these houses would require a complete rebuild from the studs up. It’s not worth. Tear down and replace and rebuild functional housing. Why waste the money…??? Seems like a poor return on the money. Extra taxes would take a long time to make up $700,000. Those people should have gotten the ok before they bought. If the new owners plan to sell after the restore then maybe half the profits could be shared by CARA to make up that other half. Is our city in the business of handouts at taxpayer expense? Yes, our city (the city of CARA) is in the business of hand-outs at taxpayers’ expense. That is what urban renewal does. Urban renewal, aka tax increment financing, has been banned for the future in California, where it was invented many years ago. But, Albany’s leaders, the Mayor, and the city council, which are the actual CARA control (they hand out the money) want CARA to go on in perpetuity. Well, evidently I can’t criticize this crony capitalist (Valley Homes Inc.) for demanding a $500,000 handout and cheap loan from CARA, a “lender of last resort” according to the previous city attorney. But everyone must ask, will the developer’s demand for only $500,000 encourage CARA to take unnecessary risk with taxpayer money? Let’s do some simple math. With $1,419,400 the cost of each of the three houses will be about $473,000. The developer would have to sell each house for about $568,000 to achieve the industry standard 20% markup. Does anyone, even CARA, believe that such a pipe-dream is achievable in the most slummy part of Albany? One can only hope that the CARA Advisory Board and ARA (city council) aren’t high on legal pot when decision time comes. The developer can’t get any interest from a commercial lender. Unless these buildings have some significant historical value or contain an outstanding example of a rare architectural element, rehabbing them just doesn’t pencil out. The neighborhood would be better served with new construction with a period vibe for the exterior. This a BAD deal for us tax payers! Tear them down. Have Siegner’s apply for construction loans and rebuild them with period exteriors. They would sell for $500,000 each built as new construction with modern amenities looking like period homes…. except finding comparable sales in that neighborhood might be tough.
? If we have to foot the bill then we should get to decide what the buildings are used for. When i heard about the sale originally i was sooo excited that these buildings would finally get a chance. Now i am again very dissapointed. Additionally, i am worried that the developer may have plans for high density appartments at the site. This type of development would greatly hurt a part of town that has been through a lot of ups and downs. There is no way the developer couldn’t have known how much work was needed. Kind of seems like a scam. How can anyone think it would be okay to give a profitable company (Valley Homes Inc), a half a million dollars (a grant), of tax payers money?? And, why in the world would this developer buy condemned homes, with full knowledge of how expensive restoration work is, if he can’t do it without the taxpayer handout? What kind of welfare system is the City of Albany running? Why are the people in this community so obsessed with preserving old buildings? And why is CARA so obsessed with giving public dollars to fund private restoration efforts which, when completed, benefit the new owners and few others? There is nothing inherently good about preserving the illusion of the past. The urge to look back, to imagine that an earlier time was a better time, an era worthy of expensive restoration is strictly a human construct. Old buildings, like new buildings, are simply that and nothing more. Given that the new owners have appealed to CARA as the last resort, one must wonder: did the developers not understand the severity of condition the three buildings faced, in which case perhaps they ought not be in the rehab business, OR did the developers know something in advance as to where CARA’s proclivities might lie and thought they might be a shoe-in for grants and loans. Ultimately, it comes down to whether or not one believes there is a place for public investment in what seems destined to become a private, money-generating scheme. If the goal is to create properties that pay back into the system through property taxes, then what possible reason is there to recreate faux impressions of an era that has long since passed? Build something new and green and look to the future. Just to let everyone know the developer is a nice guy, but a very silently ambitious land owner, if everyone goes to 2nd and madison , he tore down a single family home and some how was able to build 2 duplexes, thats 4 units on one piece of propery, and he recieved a grant from cara and i believe part of it he did not have to pay back., They recently build a new home on the old cara directors property down by the hospital. most builders with good credit could walk into most banks. the difference in property tax payback on the property would be aprox 100 years do the math from the current assessment to the new one and divide it down , NOT A VERY GOOD INVESTMENT FOR OUR CITY. and we have 2 new people running cara now, hopefully the board sees that. OPPS the cara chairman is a advocate for redoing old buildings, maybe a recuse is in order for him. Huh? A million bucks of public money with no return? The purpose of Tax Increment Financing is to achieve a positive ROI. Is TIF money appropriate on this project? Albany has become California. At least California had the good sense to recognize the lie that props up this scheme. When ‘increment’ is reduced to slush fund, every CARA expenditure becomes suspect. In answer to Dennis Clarke, yes, CARA is in the business of handing out money at taxpayers’ expense. The Mayor and Council, who hand out the CARA money, want to continue CARA in perpetuity. And, yes, to other commenter (named Taxpayer), CARA should be forced to spend a million dollars on the city streets. If public resources go into this project, they should be used on housing for the displaced families. Hasso, how about a follow up to see how the folks who occupied the homes are doing? Raze them! …if they need to be torn down to the studs there is ZERO need to stop there. Bet more troubles await. Hello termites. In reality, who cares about wasted tax payer $$$. Just look at the 45/GOP federal level with the EPA chief’s spending of our dollars on a sound proof booth in his office when one already exists in the facility or that stuck at HUD secretary. Remember him? Ben Carson wasting money on a 31K dining table. It doesn’t end there. Sweet Republican swamp! What a farce the current state of the USA is. Local and Federal levels. hj.anony1: Thanks for putting in print that it isn’t just the federal level government that is a mess (you said farce, which is true)….the local level government also is a mess.